Fred DeLuca- "What's happening to us is beyond whatever I imagined. " It was an extremely serious goal in that it never changed. We never had a discussion about changing the goal. We always talked about the goal; we always kept it in mind. We thought it was achievable because the other guy had done it. I didn’t have big family expenses. I didn’t have high expectations. I was willing to try solutions that other people may not even have thought of. I’m not saying they were all smart solutions, but I tried them. I walked to town hall and said, “I have to get some kind of license for the store I’m going to open.” The lady behind the counter said, “We need some kind of plans for your store.” I said, “Well I don’t have any plans.” She said, “If you could draw something out, that would be great.” So I drew a sketch, gave it to her, she stamped it, and that was it. I didn’t know enough about business to realize how bad we were doing. And I didn’t have the concept that you should quit at something. I can think of so many reasons why we shouldn’t have made it. We were on the edge continuously. Where our families had met in upstate New York, there was a small chain called Mike’s. The day we talked, he pulled out a little newspaper clipping about Mike Davis, the guy behind Mike’s. He started with nothing, and after 10 years, he owned 32 stores. If we didn’t drive around to deliver checks, which is a totally inefficient thing to do, I am positive that we would not have built the kind of relationship that allowed them to be as comfortable with us. What’s happening to us is beyond whatever I imagined. If you told me 30 years ago that one day I’d be sitting in a Subway store in Russia, I’d have said you were crazy. I talked to Pete on Sunday. I borrowed my dad’s car on Monday and drove around a little bit and found a vacant store. I didn’t even carry it to the ceiling or put Sheetrock on the back. I put ads in the newspaper saying something like, “Student needs refrigerator,” and I’d buy old household refrigerators for ten bucks apiece. You’d sell the sandwiches for cash today, and you’d pay the employees and the food bill tomorrow. So we had the float. When we approached our goal of 5,000 stores, I thought our growth would begin to slow, but that didn’t happen. Growth continued at a steady pace. We must be the fastest-growing restaurant company ever in terms of rate. You know, you start a business and you really don’t have much of a budget. He said, “You order some sandwiches, and when the kid” – he was referring to me – “when the kid turns around to make them, you just take a case of soda out of the cooler and sneak it out to your car.” So, you see, the lessons I learned back then – they were so simple. We didn’t really know the franchising business, and it’s (a very) different business from the store operations business. Just because we knew how to run stores didn’t mean we knew how to run a franchising company – at that point, we were in the beginning stages of learning how to be a franchiser. We would not have franchised if we didn’t have this plan. I’m building a sandwich store. Our job in the next five years is to build an international infrastructure. And that’s done one store, one person at a time. Subway is known for the fact that we bake our own bread in the store every day. But it’s not just what we have. It’s who we are. Here at Subway, we’ve built a strong organization that can offer franchisee support. Never had plans drawn, never went to the city for building permits. In February, the store was doing so bad that we were thinking of closing up. We talked ourselves into building the second store. I thought initially that it would be a small-scale business. But after I brought in franchising we got to about 200 stores in the early 1980s. It was then that I wondered how well we could really do. It was a little five or 10 minute social visit. We’d come with a check and they’d say, “How’s business?” and we’d say a little something. And they’d be fine with it. They knew we were always there to pay the bills, even though we never paid as much as we bought and balances always built up. It’s not necessary to be so structured in this world. With all the people who work here, whether you are real structured or not, it is not going to affect how much work they do. People have inside of them a certain work ethic, and, if you appeal to them nicely, they’ll respond and give all they can give. The stores we do open tend to stay open. The closing rate is very, very low. So our franchisees tend to have a great enthusiasm for expanding. In fact, every year the ratio of stores built by existing franchisees is something close to 70 percent. There’s nothing in that store that would pass muster today. 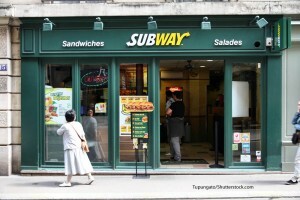 We have good market acceptance and that’s why Subway is growing very nicely. We win markets one customer at a time – that’s been our simple formula since the beginning.